Javier Fernández Sánchez / Getty Images. The golden eagle (Aquila chrysaetos) is a large diurnal bird of prey whose range extends across the Holarctic region (a region that encircles the Arctic and encompasses areas within the Northern Hemisphere such as North America, Europe, northern Africa, and northern Asia). The golden eagle is among the largest birds in North America. They are among the most popular of national emblems of the world (they are the national bird of Albania, Austria, Mexico, Germany, and Kazakhstan). Habitat: Mexico through western North America to Alaska with occasional appearances in the east; Asia, northern Africa, and Europe. Golden eagles have powerful talons and a strong, hooked bill. Their plumage is mostly dark brown. Adults have a shiny, golden swatch of feathers on their crown, ​nape, and sides of their face. They have dark brown eyes and long, broad wings, Their tail is a lighter, grayish brown as are the undersides of their wings. Young golden eagles have white patches located at the base of their tail as well as on their wings. When viewed in profile, golden eagles' heads appear relatively small while the tail seems quite long and broad. Their legs are feathered their full length, all the way to their toes. Golden eagles either occur as solitary birds or are found in pairs. Golden eagles inhabit a wide range that stretches throughout the Northern Hemisphere and includes North America, Europe, northern Africa and the northern parts of Asia. In the United States, they are more common in the western half of the country and are only rarely spotted in the eastern states. Golden eagles prefer open or partially open habitats such as tundra, grasslands, sparse woodlands, scrublands and coniferous forests. They generally inhabit mountainous regions up to 12,000 feet in elevation. They also inhabit canyon lands, cliffs, and bluffs. They nest on cliffs and in rocky outcrops in grasslands, shrublands, and other similar habitats. 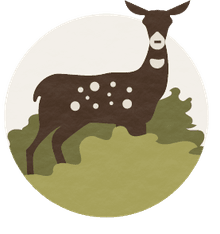 They avoid urban and suburban areas and do not inhabit dense forests. Golden eagles migrate short to medium distances. Those that breed in the far northerly regions of their range migrates further southward during the winter than those that inhabit lower latitudes. Where climates are milder during the winter, golden eagles are year-round residents. Golden eagles feed on a variety of mammal prey such as rabbits, hares, ground squirrels, marmots, pronghorn, coyotes, foxes, deer, mountain goats, and ibex. They are capable of killing large animal prey but usually feed on relatively small mammals. They also eat reptiles, fish, birds or carrion if other prey is scarce. During the breeding season, pairs of golden eagles will hunt cooperatively when pursuing agile prey such as jackrabbits. Golden eagles are agile avian predators that can dive at impressive speeds (as much as 200 miles per hour). They dive not only to catch prey but also in territorial and courtship displays as well as regular flight patterns. 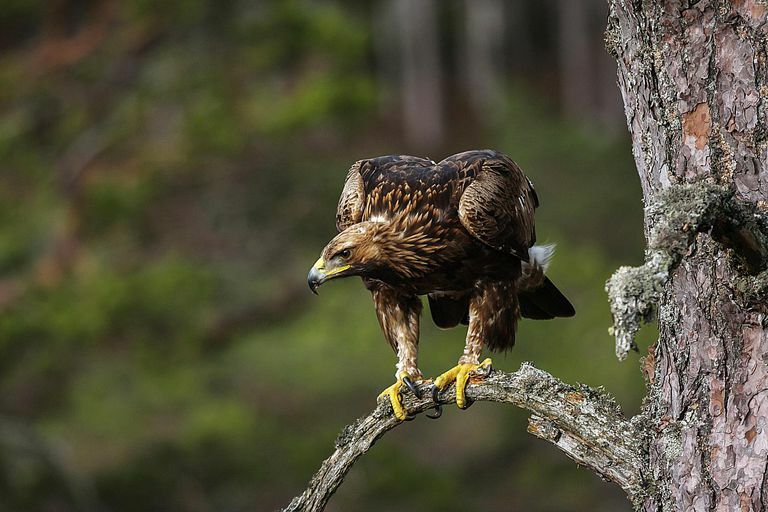 Golden eagles construct nests out of sticks, vegetation and other materials such as bones and antlers. They line their nests with softer materials such as grasses, bark, mosses or leaves. Golden eagles often maintain and reuse their nests over the course of several years. Nests are usually positioned on cliffs but are also sometimes located in trees, on the ground or on high man-made structures (observation towers, nesting platforms, electrical towers). The nests are large and deep, sometimes as much as 6 feet wide and 2 feet high. They lay between 1 and 3 eggs per clutch and eggs incubate for about 45 days. After hatching, young remain in the next for about 81 days. There are large and stable populations of golden eagles in multiple locations around the world, and thus the species has a status of "Least Concern." Much of the reason for their success is the result of conservation projects to protect both the birds and their habitats. The golden eagle has been a federally protected species since 1962, and several international groups dedicate themselves to the welfare of golden eagles and eagles in general. Juvenile bald eagles look very similar to golden eagles. They are about the same size with a similar wingspan, and, until bald eagles reach about a year of age, they have the same brown feathers covering their entire bodies. Juvenile bald eagles do have mottled underbellies, and they don't shine in the same way that golden eagles do—but it's tough to spot these differences in a bird in flight. It's not until after their first year of life that bald eagles start to show their distinctive areas of white plumage. Because of this similarity, it's common for birders (especially in the eastern part of the United States) to believe they've spotted a golden eagle when they've actually seen a juvenile (and more common) bald eagle. “Golden Eagle.” National Geographic, 24 Sept. 2018, www.nationalgeographic.com/animals/birds/g/golden-eagle/. “Golden Eagle.” San Diego Zoo Global Animals and Plants, animals.sandiegozoo.org/animals/golden-eagle. “Golden Eagle Demographics.” American Eagle Foundation, www.eagles.org/what-we-do/educate/learn-about-eagles/golden-eagle-demographics/#toggle-id-2. “Is That Golden Eagle Actually a Bald Eagle?” Audubon, 3 July 2018, www.audubon.org/news/is-golden-eagle-actually-bald-eagle.